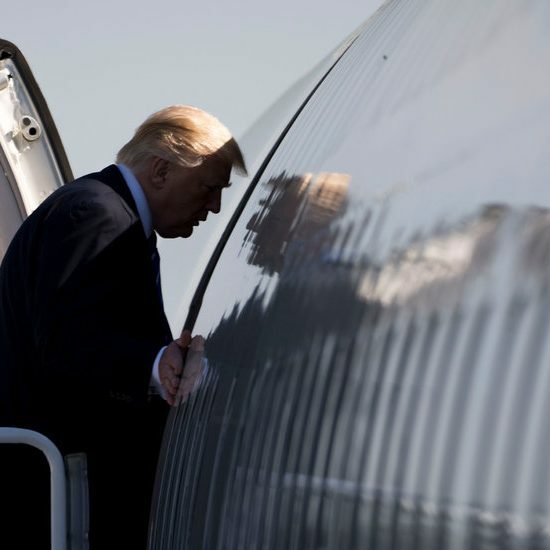 In The New York Times, Janet Maslin began her review of the movie with this: “One way to get through ‘Baby Geniuses’ is to think about whether it really is the worst movie you’ve ever seen. Probably not, but pretty darn close.” Roger Ebert called it one of the worst movies of 1999. When “Superbabies: Baby Geniuses 2” wrapped, so did the Fitzgeralds’ big-screen careers. Though undersize — Leo is 5 feet 9 inches, Gerry 5-8 and Myles 5-7 — the Fitzgeralds formed such a prolific forward line through junior hockey that they were twice traded as a unit. 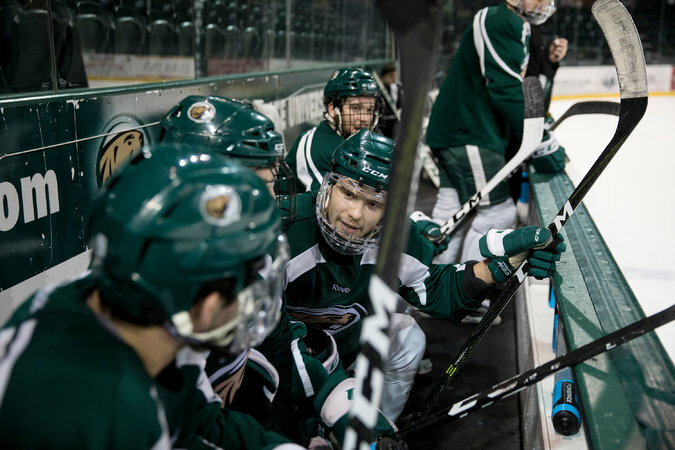 Their wish to attend college together brought them to Bemidji State, a Division I program in the north woods of Minnesota that made an unexpected run to the Frozen Four in 2009. 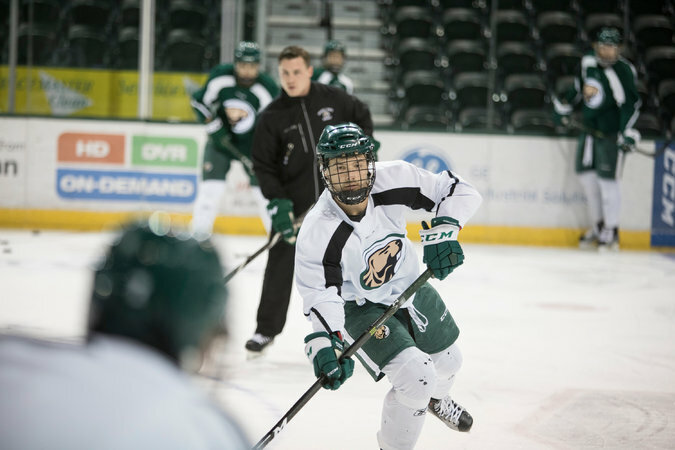 Leo Fitzgerald, center, during practice at the Sanford Center, Bemidji State’s home rink. Now juniors, the 23-year-old triplets have combined for 15 goals for the 20th-ranked Beavers (16-9-3 over all), who lead the Western Collegiate Hockey Association standings by 9 points and seek their first N.C.A.A. tournament berth since 2010. Research by Bemidji State officials turned up only one other set of triplets on the same college team: Brian, Craig and Glenn Seabury of the University of Massachusetts Lowell from 1989-90. But this season Serratore, seeking better offensive balance, moved Myles off the line and installed the senior Brendan Harms on left wing with Leo and Gerry. That line has accounted for 19 of Bemidji State’s 66 goals. Hockey players can be cruel teasers, and Harms said the Fitzgeralds still took occasional needling about the movies. Serratore, though, has never shown either film on the team bus. For that, the triplets are grateful. The story of how the Fitzgeralds landed in Hollywood might make a better movie than the ones they appeared in. Janet Fitzgerald said her sister thought the boys were adorable and urged her to submit photos to a Vancouver talent agency. So she did. A few weeks later, the agency invited them to a casting call in Vancouver for “Baby Geniuses.” The producers sought triplets or twins for the two leading toddler roles. Five months of filming in Southern California followed. (The sequel was shot in Vancouver.) Their mother said that Turner and her co-star Dom DeLuise were wonderful with the boys, and that she still kept in touch with Jimmy Wagner, a so-called Hollywood baby wrangler who helped the boys learn their dialogue. Gerry remembers rehearsing lines for the second film with Voight in the star’s trailer. Gerry Fitzgerald during practice. At Bemidji State, it did not take long for teammates and coaches to figure out how to tell the brothers apart. But hockey quickly consumed them. Leo took it up first, following their older brother Sheldon, and Gerry and Myles soon joined in. Their mother said she only recently repaired the broken windows and smashed stucco on their house, caused by thousands of pucks sailing high and wide of the net that the boys set up in their carport. She declined to identify the son who destroyed a living room window with a poorly aimed slap shot from the road. At Bemidji State, it did not take long for teammates and coaches to figure out how to tell the Fitzgeralds apart. (Leo and Myles are identical and Gerry is fraternal, their mother said.) Leo is the tallest, the only left-handed shot, and prefers a clear face shield on his helmet; the others wear the wire-cage style. Sitting for an interview at the Sanford Center, Bemidji State’s home rink, the Fitzgeralds subtly differentiated themselves. Leo and Gerry wore Bemidji hockey ball caps, Leo with the brim facing forward, Gerry’s backward. Myles sported a Minnesota Twins cap. The Beavers do not score a lot, instead relying on team defense and the standout junior goalie Michael Bitzer. Bemidji State leads Division I in scoring defense at 1.79 goals allowed per game, and penalty killing at 90 percent.